So can you name the bean??? I will give a description of the plant and it's growing nature...I have even included a couple of pictures....however I won't be able to tell you if you're right because I have no idea what it is called so this isn't a guessing game but a plea for knowledge. The beans in their plant-able state are about the size of a french bean and are sometimes dark purple/black and sometimes brown. The plants require a framework up which to climb and produce pretty little purple and white flowers. The beans pods that grow are about the same size as those of french beans and are either purple, pink 'ish' or green in colour when harvested. Above are some of the harvested beans ready for cooking. The beans, although being a similar size and shape as french beans have a 'string' running down the seam like on runner beans. This needs trimming before being cooked as it is not very palatable. As is the case with some of these vegetable once blanched they all turn a vibrant green no matter what colour they started out as. So that is about as much as I can tell you about them...I don't have a picture of the plant at the moment but I could take one if you think that might clinch an answer for you...Oh and the reason I don't know what they are is because i was given the seed from a friend who was given it by someone else who didn't know what it was called either. Here's hoping someone will know!! Well the weather man really came through this time...the weather is GORGEOUS!!!!!!! It was 23 degrees today in the shade with a lovely warm breeze and clear blue skies....it gives this to keep up until at least the weekend so I am very happy!!! Check out that September sky! The nights have been quite damp which means we are getting up to a lovely fresh aroma. Sunrise is getting late now and today it was gone half six when it came up and it was setting by 7pm so I will be enjoying this nice weather whilst it lasts. Not much allotment activity for me this last week but with the lovely weather I did go and collect some salad stuff today for a lovely fresh dinner. Hope the weather is being as kind to you. A wonderful fresh dinner...though I have to admit to buying the ham from the butchers...but everything else is off the allotment!! Would you consider it a glut???? 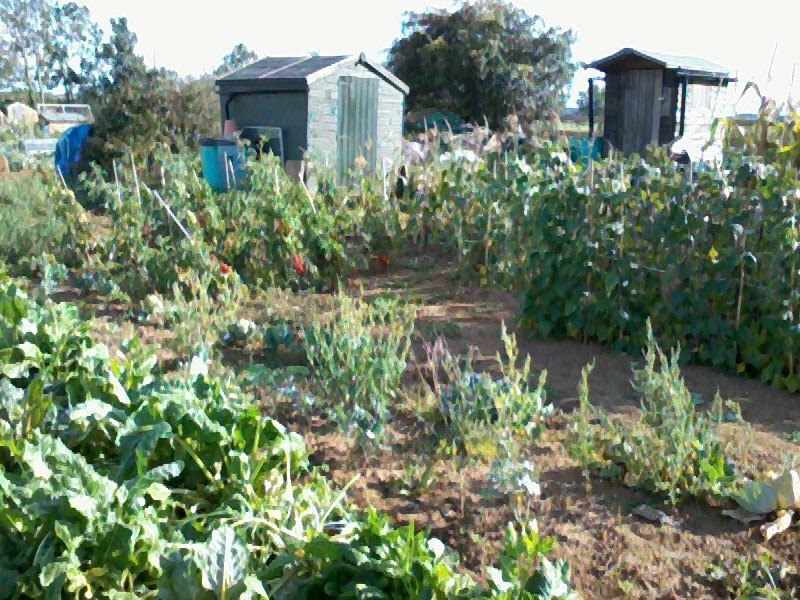 Well I popped down the allotment at the weekend to do a little (okay...A LOT!) of harvesting. I only went with one intention...TOMATOES!!! Above is half of what we picked!! So would you consider this a glut?? I have only picked about a quarter of the fruit...yet I intended on growing so much as there is lots of stuff you can do with tomatoes and they are all scrumptious!! This is 'tomato butter' bubbling away in the pan...the end product is more like jam though...I think I cooked it a little too long. But it is very nice! This is some tomato soup that I made. A very basic recipe...I am going to be making some chunky tomato soup too!! I have also made up some tomato and basil pasta sauce, and I have yet too make Ketchup in two varieties and some other soups and pasta sauces...and I think I may try drying some too. I still have much more fruit to harvest and yet I wonder with all my plans if I will have enough...only time will tell if I need to plant more next year. So what do you like to do with your tomatoes?? 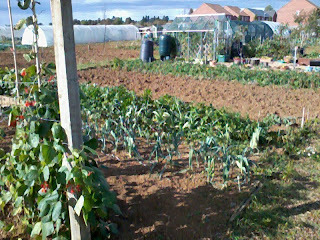 That's it for now...but more posts to follow this week as there has been plenty more to harvest at the allotment!! Well I am in from work and homework has been completed so the last thing I really want to do is sit here and right a post so it's going to be another quick one. The weather is pretty much what you can expect this time of you...low blinding sun with a chill to the air. We've had some heavy rain but only briefly. We did suffer with some horrific winds last week but these have thankfully past us by without causing damage and so we are back to normal for a while. I will be getting down the allotment for a time again over the weekend and getting some cooking done too so I will have lots to tell and also whilst my pans are bubbling away I am hoping to find some time to catch up with all my favourite blogs. The days are quickly getting shorter and it won't be long now before we move the clocks!! The quickest allotment post EVER!!! I feel bad as I still have got my head into gear and myself sorted int0o a routine yet so my blog is suffering. I promise I will get sorted by the end of the week though and catch up with you all and get myself organised...up till then here is a little progress!! So this was as far as we got the first weekend...a huge improvement and then we moved on to the other half last Saturday. 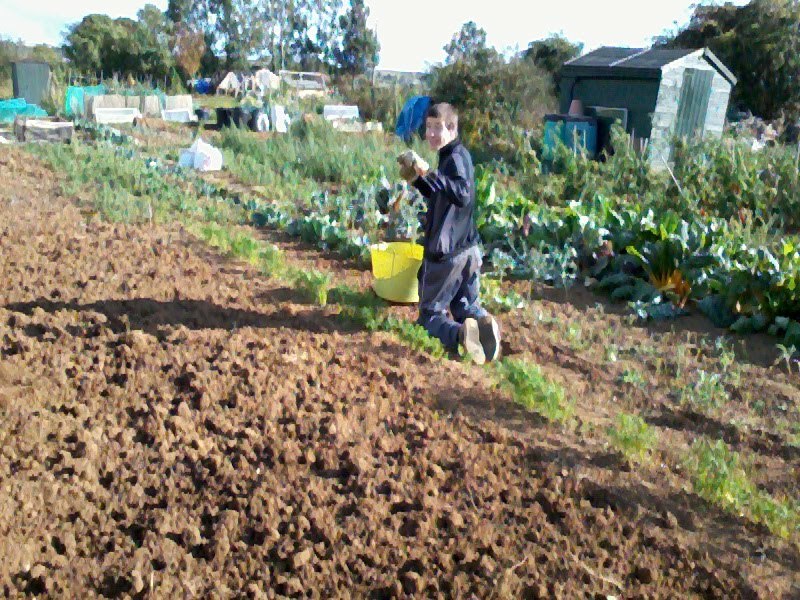 A little help goes a long way though...we even found a healthy looking carrot row!! The pond area also got sorted...again no finished product pictures but we got on quite well but not quite getting it all done. I went visiting neighbours to get rid of some of the weeds!! That's it for now...at least you didn't get the chance to get bored whilst reading..lol. Hi All....yes I am back. Well OK I have to admit that I have been back at home for a week now but with all the usual stuff to contend with when you get back form a holiday plus new jobs starting and college term beginning I just haven't managed to get down the allotment so had nothing to report!! closed my eyes and mind off to all the weeds that had grown in my absence...but this weekend I was on a mission and so i got myself. (and a couple of helpers!!) 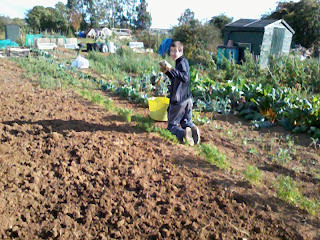 down the allotment and worked! Well above and below you can see what sort of mes I was in. This is just half of the plot but I can assure you the other doesn't look any better. Personally I think one photo would have done but my son was playing with the camera. See and all my readers though I had such a tidy plot!! So you can see how much work I had on. Anyway we all worked really hard...my son and nephew helped out for a couple of hours with the weeding too which I was very grateful for. The onions got lifted, the rest of the new potatoes dug, all the weeding done...the squash plants tamed and the carrots found. 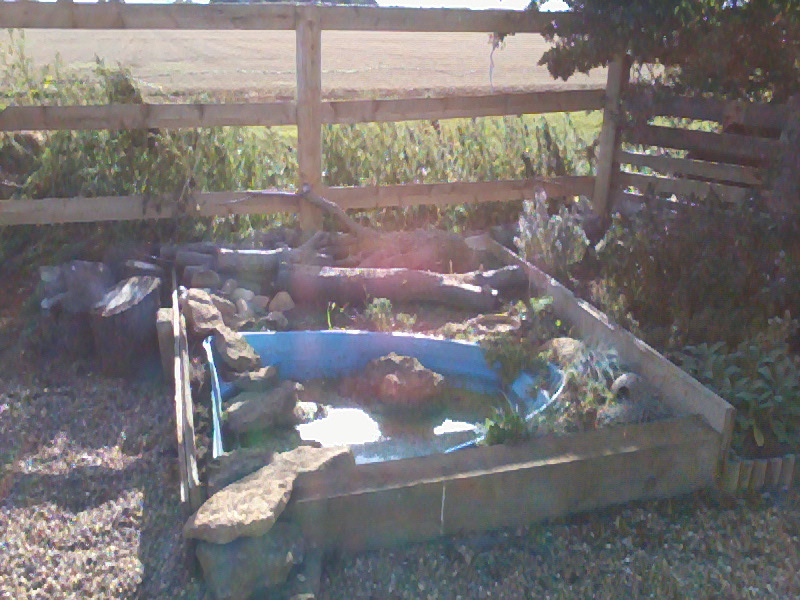 I also sorted out the tubs on the gravel and pulled the weeds in that area too...all in all an excellent day!! Above is one of the blackberry brambles I bought...it's going wild near the greenhouse so I think I will dig it up and put it near the fence at the top end of the plot behind the shed and pond...that way it won't matter what it does....what do you think?? Above again is my son taking photos...anyway this is me with the chair of the committee who came to had a chat with me about a recent bout of thefts and vandalism....the police came up to talk to her but I don't see us getting much joy from them. So that's about all I have for now.....I fully intended on getting some 'after' photos for you but it was that dark when I finished they didn't turn out very well but I can tell you that I am much happier than I was yesterday morning...even if a little achy! I will go up the plot at some point today but purely to harvest...I think a few days rest is on order before I tackle the other side.